Would you like to spend a day in the boat with any of our staff? Many of us are licensed guides and charter captains throughout our range. We have somebody for everyone, chasing every fish that swims! Check them out. With 35 years of experience fishing the waters of Southern Wisconsin, the "Madison Chain", Norther WI, and the muskie superfish waters of Minnesota Mille Lacs, Vermilion, Leech, Cass, Lee has a lifetime of experience on some of the best waters in the Midwest. Lee is also the owner/maker of Lee Lures Custom Baits, which are some of the most sought after handmade lures available. Growing up on the shores of Rock Lake in Lake Mills, WI, I started my obsession with fishing as soon as I could hold a pole. Spending every moment possible on the water has honed my skills as a fisherman. My fishing highlights include catching a 50 pound class musky. Starting my fishing guide service in 2016 was a lifelong dream of teaching people to fish. My name is A.J. Wiesner and I am a muskie fishing addict! With countless nights spent sleeping in my boat, truck, or island; I can honestly say that muskie fishing is one of my true passions in life.My goal is to not only educate clients on fish patterns, but also customize each trip to ensure everybody is having a great time in the boat. So plan your trip up north to beautiful Lake Vermilion this summer and give me a call for a chance at your very own LIVING LEGEND! I have been a resident of Madison Wisconsin and fished the Madison Chain his entire life. I am a life long fisherman and outdoorsman. I have been a professional musky guide on the Madison Chain of lakes for 21 years and am a full time guide. Depending on the season, weather conditions and bite I guide on Lakes Monona, Waubesa, upper Mud, Yahara river, Wingra and Twin Valley in Dodgeville WI. Noah Humfeld is an extremely polished multi-species angler with an extensive knowledge base of the Madison Chain of Lakes ecosystem. He specializes in all species utilizing a multitude of techniques. Noah is also the owner and president of The Madison Angling Experience; a media/guiding enterprise specializing in all things Madison, WI fishing. Also to his credit is spending several years competing for and running the University of Wisconsin-Platteville Bass Fishing Team. 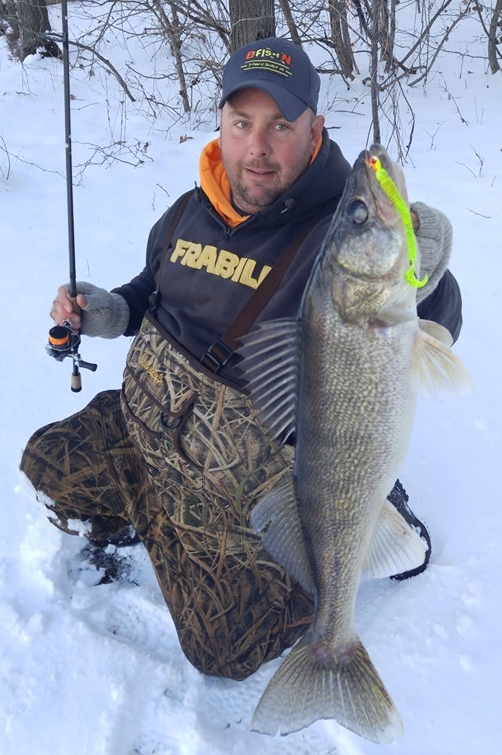 Jesse is the owner/operator of Green Water Walleyes Guide Service for over 17 years in central Wisconsin as a full time Hunting and Fishing Guide. From open water wade fishing, boat fishing, ice guiding, to turkey/waterfowl/bear hunts Jesse has got it all covered. We highly recommend him as one of the hardest working guides out there! Chris Taurisano is the owner/operator of T-BONE Guide Service. He guides full time in northern Illinois and southern Wisconsin and is a multi species guide dedicated to teaching others to become better anglers and help them them enjoy the outdoors. Chris is a full time, year round musky guide. Splitting his season between the rivers and lakes of northern Wisconsin, and the rivers of central Tennessee. Chris specializing in fly fishing, but does run conventional musky river trips. For the angler that's trying to experience a different approach on musky fishing this is the trip for you. From novice to seasoned veteran Chris can get you on the fast track to casting and fishing effectively with a fly.